People often think their superannuation will be treated as part of their estate when they die and distributed according to their Will, but that’s not the case. Unless you have nominated your beneficiaries, the decision as to who receives your super is in the hands of the trustees of your fund. When that happens, the trustees normally direct all funds to your dependants – your spouse, your children, financial dependents and people with whom you had an ‘interdependency relationship’ such as living together. But wouldn’t it be better to nominate exactly who you want to inherit your super death benefits? (Death benefits is the term for all of the money in your super account plus any life insurance.) You can generally nominate beneficiaries with either a binding or a non-binding nomination, although some super funds only provide a member with the ability to make non-binding nominations. Under super law, death benefits can only be left to a dependent or your personal legal representative (the executor of your Will), in which case it will pass into your estate for distribution according to the terms of your Will. It’s important to note that a binding nomination generally only has a limited life. Every three years you need to advise your super fund in writing of your nominated beneficiaries or it becomes invalid. If you have not nominated a beneficiary and have not yet organised a Will, then your super will be distributed according to a state-based formula which may not reflect your intentions. It’s also important to take tax into account when nominating beneficiaries. If your spouse is alive then it is likely your death benefits will go to your partner as a lump sum and/or an income stream referred to as a reversionary pension. There is no tax liability if it’s paid as a lump sum unless both you and your spouse are aged under 60 when you die. Also, the maximum your spouse can have in their pension account is $1.6 million. So there are considerations if the death benefit pension causes your spouse to exceed this income. If your spouse predeceases you then the benefit will be divided between other dependants. Be aware though that there’s a difference in the definition of dependants under super and tax law. Under super law, a child of any age may receive your death benefit, but under tax law if they are aged over 18 and not financially dependent on you, they will be subject to 17 per cent taxation on the taxable component of the sum they receive. For this reason, your adult children may be better off receiving the money through your estate as they will only pay 15 per cent tax, saving the 2 per cent Medicare levy. If you are legally divorced, then your ex-spouse is no longer deemed a dependant under super law. However, if you still want to leave your super to your ex-spouse it must go to your estate and be paid from there. Interestingly, your ex-spouse will receive the money tax free. For those with a self-managed super fund, you can use a clause in the fund’s trust deed to either nominate a valid dependent who will receive the benefit or else have the money paid to your legal representative who will pay the money into the estate. Making sure your hard-earned money is distributed according to your wishes is not an onerous task, but it is an important one. 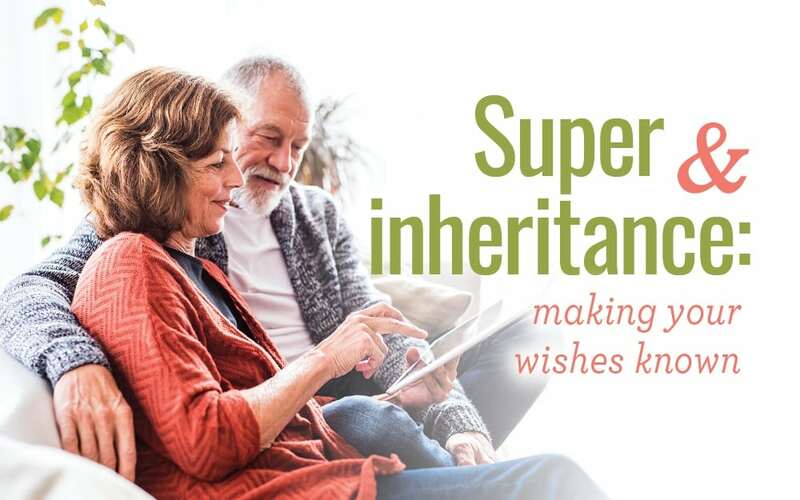 Not nominating a beneficiary, or nominating someone who is not eligible to receive your super, can lead to lengthy delays and emotional upset at what is already a difficult time for your family. Seeking professional and legal advice can help to ensure that your death super benefits are considered as part of your overall estate planning and that your wishes are carried out.